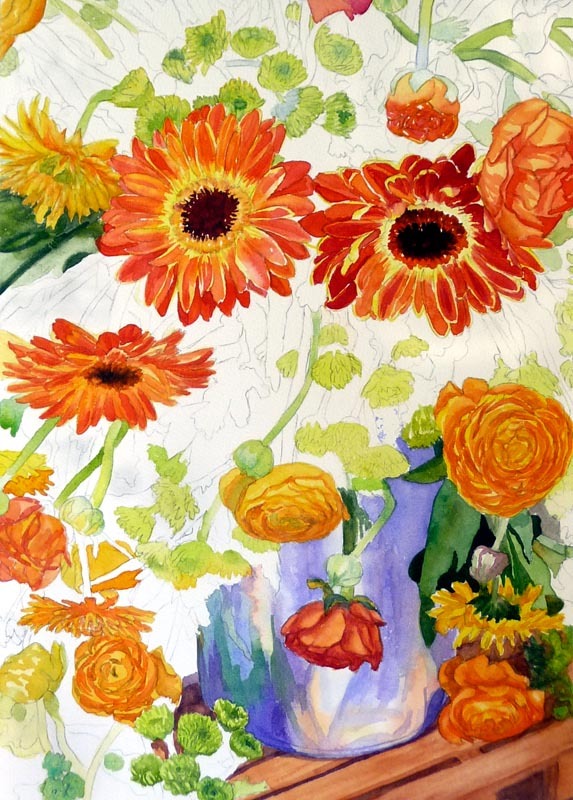 Continuing on from Part I, here is a close up as I began to paint the yellow and orange flowers. For the first layer of this flower I painted the darker sections and then used clear water in a damp brush to pull/feather the color out into the flower so it didn’t make a hard edge. 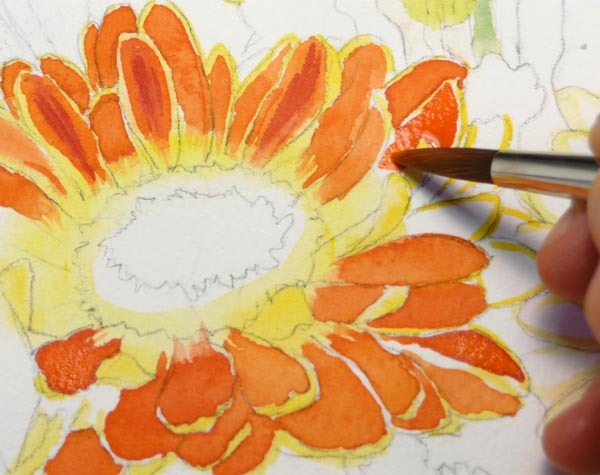 For the three large zinnias, I outlined all the petals with Holbein Cadmium Yellow Light. Then I brushed a ring of clear water around the center of each of those flowers and painted a narrower ring of yellow inside that so the paint would softly spread in the water to not quite the edge of the water, producing a soft edge. When that dried I painted the flower’s very dark center with a mixture of Winsor Newton (WN) Burnt Sienna and Winsor Violet. Then I painted the gold ring between them with WN Cadmium Orange mixed with Daniel Smith (DS) New Gamboge. 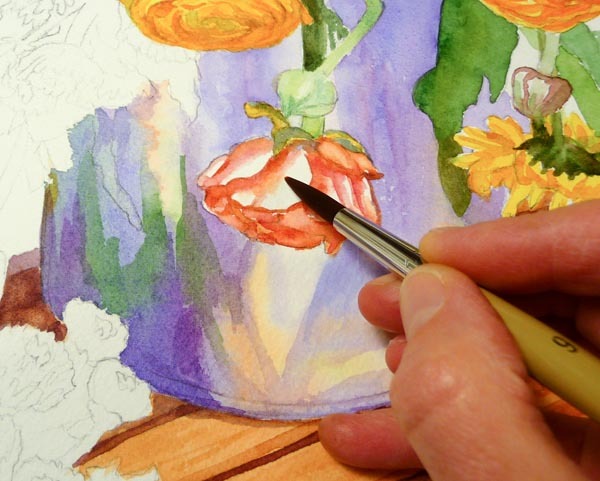 I began applying mixtures of WN Cadmium Orange, WN Permanent Rose and DS New Gamboge to one petal at a time while avoiding painting over the yellow outlines on the petals,. You can see the juicy puddle of color I like to put down. I’m careful to let it dry without shifting the tilt of the paper to avoid backwashes. 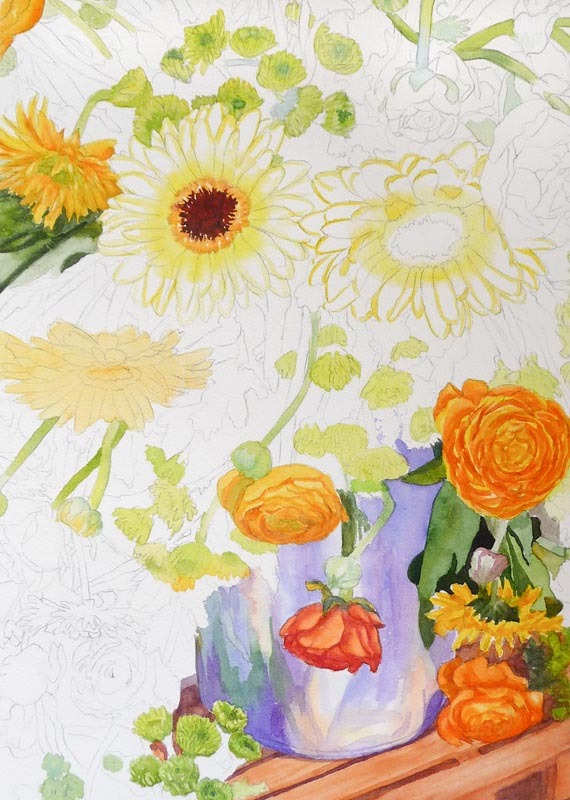 I worked all over the paper, turning the painting sideways and upside down instead of reaching across, to complete all of the yellow and orange flowers. Some of them will get touch-ups before the painting is completely finished. Next time: more greens, the dark background, and the finished painting. Meanwhile, I’ve been assigned the next painting to do: a lovely orchid which I will approach in a completely different manner. I do enjoy the process and it is helpful. As silly as this sounds I just recently learned about working from all sides of the piece, just as you described. Even with painting on fabric you can still get the back of your hand wet with paint! It took me a few minutes of working on getting a stiff neck trying to see what I was doing at the top of the page to think of turning it. Nature being the mother of invention and all that. I do like working upside down though (the painting not me) since it helps to focus on shapes and colors and turns off that left brain that wants to override what I SEE with what it THINKS should be right. These two were very informative posts. I am sure the book will be fantastic. Hope to see more “process” posts in the meantime. Oh, Jana, those zinnias (maybe?) are gorgeous! Thanks for the setp-by-steps, it’s so cool to see the work in progress. This is going to be atunning painting! Jana, these step by step instructions are amazing, lucid and inspiring. I have to say, though, that the complexity of the image induces a sort of sweaty-palmed anxiety in me. So many details! Still, I look forward to more. So much fun to see the process, Jana, and you are giving us such a lovely tutorial as well. But I hear Sherry, the complexity of that pencil drawing made me dizzy and I was ready to look somewhere else– of course, I couldn’t, and have been drinking it all in– but deliver me from ever having to do it!! Jana, your series look SO good!! Congratulations on doing a great job! Thanks for sharing your technique this is a beautil piece. This painting is going to be beautiful! I love the orange flowers against the blue container. I think watercolors are so hard to work with. I love seeing your process.